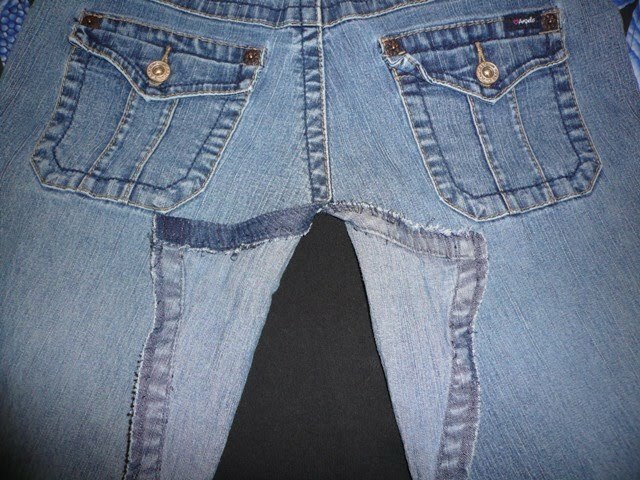 The jeans I used for this project were passed down to me from my daughter. She was 14 at the time and I was pretty thrilled I could wear her jeans. They should probably have been placed in a shrine somewhere so I could look at them any time my confidence needed a boost but when I went to my closet to find a pair to turn into a skirt, they volunteered. You will probably want to use a sewing machine for this , although if you don't have one it could be stitched by hand using some strong thread. I think my camera ate some of my photos, so there are portions of this that aren't as illustrated as I intended. To get started, you'll need a pair of jeans. A little stretch is fine, but try not to go too stretchy. It will affect the shape of your skirt. 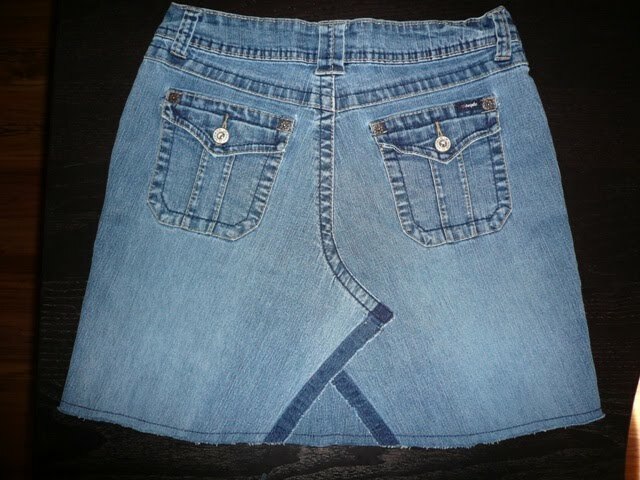 Try the jeans on and decide how long you want your skirt. Add a few inches, about 4 to 6, and mark it. You can always shorten, but good luck making it longer. 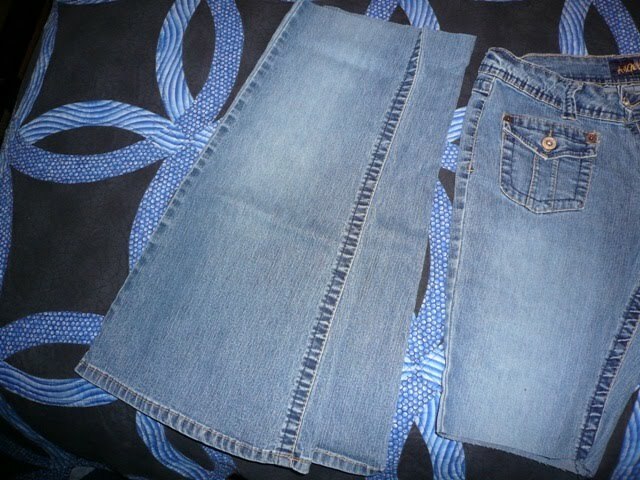 Cut off the legs parallel to the bottom hem. Using a seam ripper or small, sharp scissors, rip out entire inner seam. Now rip out the front center seam up to the bottom of the zipper. Rip out the back seam up to a corresponding point to the bottom of the zipper. This isn't an exact science - you're looking for it to lay flat when you overlap the two sides. If it doesn't, go a little higher. It can always be stitched up later. Find the widest side of the leg pieces you cut off in the first step. Most likely, it will be the back. Cut along just inside both seams so you end up with two raw edges. 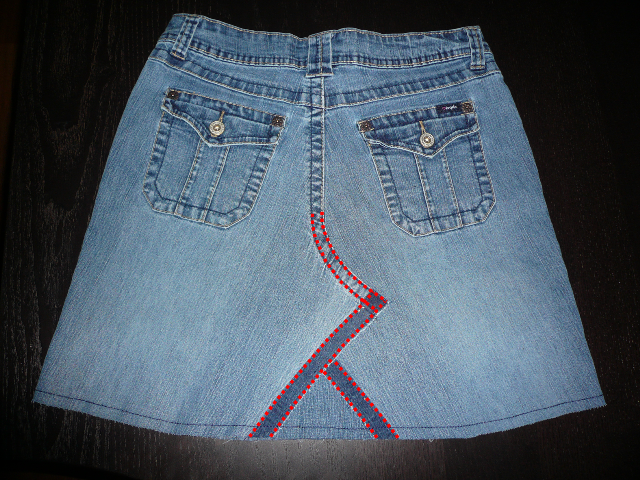 Lay the skirt flat. Starting with the front, overlap one side over the other. Pin it together with safety pins. Repeat on the back. Slide one leg piece underneath the overlapped pieces. Pin this piece in place and try the skirt on. Make sure it hangs the way you want it to. If not, adjust overlaps and pieces until it does. I like to use a product called Wonder Under to hold everything in place until I can sew it. Here's the company's website, with a little more detail: http://www.pellonideas.com/content/view/21/27/. There are other products that do the same thing, such as Heat 'N Bond and Steam-A-Seam, but they are all basically iron-on glue. You cut a strip of Wonder Under to fit inside where the stitching will be and following the instructions on the package, iron it in place. Trim the excess fabric from the leg piece at the bottom edge and inside. 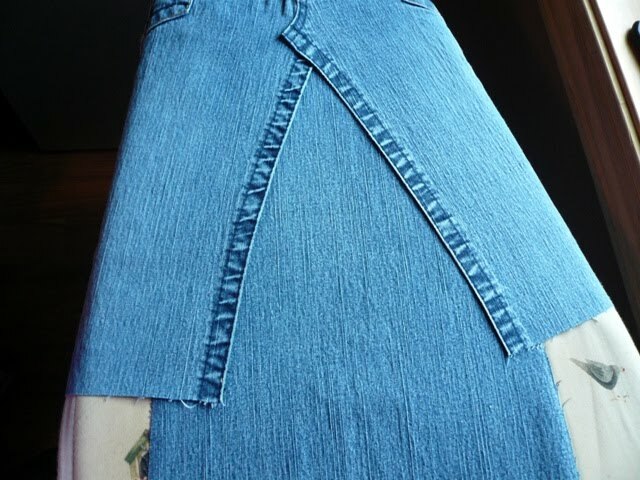 Next you'll need to trim the bottom edge of your skirt evenly. Don't trim straight across. I made that mistake and the sides of the skirt looked longer than the front and back when I put it on. You'll want to trim in a slight curve up at each side. Sew along the seams as shown. 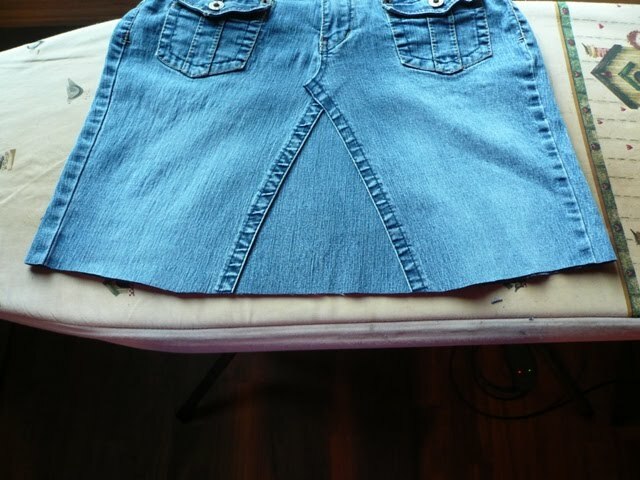 You can trim away the remaining excess fabric on the wrong side. Sew a row of stitching along the bottom edge, about 1/2 inch in. This will stop the fabric from unraveling too far. Wash and dry your skirt. You can trim the unraveled edge to the amount of strings you want. I did a lot of trimming on this one because I wanted a more even look. You'll probably have to repeat the process the first few times its washed. Finished! Tune in tomorrow for another project using the remaining leg fabric!